T-Mobile has announced the LG Optimus T. The Optimus T will be aimed at first-time smartphone buyers. It will come with Android 2.2 and deep integration with Google services including Voice actions The handset will have a 3.2 megapixel autofocus camera with video capture, a microSD card slot and a 2GB card. Oh and it will also have a 3.2-inch, 320×480 capacitive touchscreen. All this sounds pretty decent for an entry-level device. No word yet on wifi calling. Hit the jump for the full press release! BELLEVUE, Wash. — Oct. 6, 2010 — T-Mobile USA, Inc. and LG Mobile Phones today announced the latest easy-to-use and affordably priced smartphone to join T-Mobile’s extensive Android™ portfolio, LG Optimus T™. Equipped with the latest Android platform, LG Optimus T features a responsive touch screen sleek form-factor and deep integration of Google™ services, including Voice Actions. 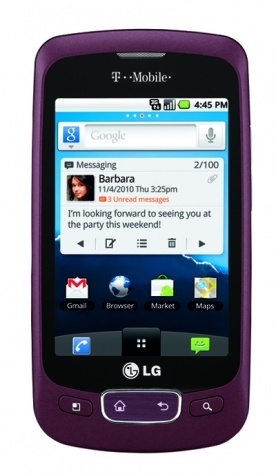 LG Optimus T makes staying connected to friends and family while on the go a quick, one-touch process. Using Voice Actions for Android, customers can control their Android-powered phone by speaking commands to call, text, e-mail and even find directions on a map, among other tasks. LG Optimus T also offers customers close integration with popular Google services, such as Google Search™ (also by voice), Gmail™, Google Talk™ and Google Maps™. With access to Android Market™, LG Optimus T customers can download and personalize their phone with thousands of free and paid applications. In addition, the customizable home screen, expandable up to seven panes, on the Optimus T keeps life simple by bringing what matters most upfront and center, including favorite applications and widgets. The Optimus T comes equipped with a 3.2-megapixel autofocus camera with video capture, as well as pre-installed 2 GB microSD card and support for up to 32 GB of removable memory. Offered in a Burgundy or Titanium finish, the LG Optimus T is expected to be exclusively available to T-Mobile customers this holiday season. For more information about T-Mobile products and services, please visit http://www.T-Mobile.com. Google, Android, and Android Market are a trademark of Google Inc.
Based in Bellevue, Wash., T-Mobile USA, Inc. is the U.S. wireless operation of Deutsche Telekom AG. By the end of the second quarter of 2010, more than 130 million mobile customers were served by the mobile communication segments of the Deutsche Telekom group — 33.6 million by T-Mobile USA — all via a common technology platform based on GSM and UMTS, the world’s most widely used digital wireless standards. T-Mobile USA’s innovative wireless products and services help empower people to connect to those who matter most. Multiple independent research studies continue to rank T-Mobile among the highest in numerous regions throughout the U.S. in wireless customer care and call quality. For more information, please visit http://www.T-Mobile.com. T-Mobile is a federally registered trademark of Deutsche Telekom AG. This press release contains forward-looking statements that reflect the current views of Deutsche Telekom management with respect to future events. The words “anticipate,” “believe,” “estimate,” “expect,” “intend,” “may,” “plan,” “project” and “should” and similar expressions are intended to identify forward-looking statements. Forward-looking statements are based on current plans, estimates, and projections, and therefore you should not place too much reliance on them. Such statements are subject to risks and uncertainties, most of which are difficult to predict and are generally beyond Deutsche Telekom’s control, including, without limitation, those factors set forth in “Forward-Looking Statements” and “Risk Factors” contained in Deutsche Telekom’s annual report. If these or other risks and uncertainties materialize, or if the assumptions underlying any of these statements prove incorrect, Deutsche Telekom’s actual results may be materially different from those expressed or implied by such statements. Deutsche Telekom does not intend or assume any obligation to update these forward-looking statements. LG Electronics, Inc. (KSE: 066570.KS) is a global leader and technology innovator in consumer electronics, mobile communications and home appliances, employing more than 80,000 people working in more than 115 operations including 84 subsidiaries around the world. With 2009 global sales of USD43.4 billion, LG is comprised of five business units – Home Entertainment, Mobile Communications, Home Appliance, Air Conditioning and Business Solutions. LG is the world’s leading producer of flat panel TVs, audio and video products, mobile handsets, air conditioners and washing machines. LG has signed a long-term agreement to become both a Global Partner and a Technology Partner of Formula One™. As part of this top-level association, LG acquires exclusive designations and marketing rights as the official consumer electronics, mobile phone and data processor of this global sporting event. For more information, please visit www.lgusa.com. LG Electronics Mobile Communications Company is a leading global mobile communication and information company. LG creates handsets that provide an optimized mobile experience to customers around the world with its cutting-edge technology and innovative handset design capabilities. Increasingly, LG is pursuing convergence technology and mobile computing products. LG will continue to take leadership in the mobile communication environment with stylish designs and smart technology. For more information, please visit www.lgmobilephones.com.